A Cookstown resident has called into question the safety of incoming car parking angles that will force drivers to reverse into the main road. The father-of-three, who’s a grade one advanced driver but didn’t want to be named, told the Mail there are many reasons why it is not advisable to drive into a parking space or back on to a road. He is calling on Mid Ulster council to angle the parking bays so drivers have to reverse in, but can simply drive out. “The council are telling you to do something which is contrary to what the Highway Code is saying,” he explained. “If you drive into a parking space and then have to get something out of the boot of your car, you’re then standing out next to the traffic, but if you reverse in, you’re on the footpath. “Also if you’ve got young children in your car and if you reverse into a parking space, the door stops them running out into the traffic. “It’s wee things like that, that are the reasons your supposed to do it - they are road safety related. “For the past 30 years I have been a grade one advanced driver and I know about road safety and what’s expected,” he went on. “If you’re a young person and you’re doing your driving test... you are taught you must reverse in. “I fully accept that a lot of people in Cookstown drive into parking bays because it’s handier. “But the way the council are carrying out their scheme - they’re going to make it impossible for you to reverse in. However, a spokesperson for Mid Ulster council said the new parking angles do take “road safety” into consideration. 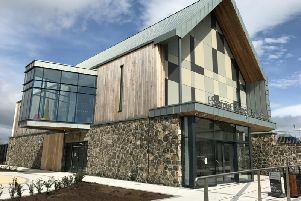 “The proposed parking arrangement along the main street have been designed and agreed, taking into account the history of parking in Cookstown, as well as road safety and traffic flow factors,” she said. “They also reflect the recommendations of consultant engineers and Transport NI. A spokesperson for TransportNI, which said it had been consulted on the plans, added: “The changes to parking arrangements in Cookstown are part of a wider public realm scheme which is being delivered by Mid Ulster District Council. “TransportNI was consulted regarding the proposals at the planning and design stages and are content that the proposals being put forward are of an appropriate standard and will be subject to an ongoing safety audit process.